With a distinctive, warm and earthy voice, West African Adjiri Odametey sings his songs. Always melodious, sometimes melancholy, they are all marked by a positive mood. Adjiri Odametey plays african world music. Combining his earthy voice with the sounds of native African instruments, including kora, kalimba, mbira and balafon, his music captivates listeners. Global Pop is a better expression for the so called World Music - according to Deutschlandradio Kultur. Global Pop is the "music of our time". 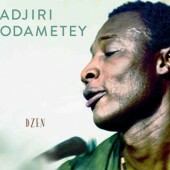 African World Music: A warm, earthy voice is the trademark of West African singer-songwriter Adjiri Odametey. Listen to his new album DZEN! The media often compares him to Geoffrey Oryema but attests to his own unique musical style. In a manner as cools as the musician himself, he has managed to create a natural crossover between Africa and Europe, becoming an authentic intermediary between the two worlds. For all his modesty, this charming musician is a brilliant live performer. A warm, earthy voice is the trademark of West African singer-songwriter Adjiri Odametey from Ghana. He plays African World Music combining this voice with the sounds of native African instruments, such as kora (African harp), the balafon (wooden xylophone) and the thumb-pianos kalimba and mbira. He effortlessly succeeds as a crossover artist. Adjiri Odametey has secured a place in the international music scene through the distinctive sound of his African World Music.